“Miss the rest of the season or figure out a way to play.” That’s what a team doctor told former Washington Redskin Fred Smoot after he fractured his sternum. Worried about his livelihood, Smoot chose the latter, he figured out a way to play. To mask the pain, Smoot injected regular doses of the short-term post-op anti inflammatory Toradol. It’s difficult to imagine that each player that’s ever played in the NFL couldn’t tell horrific stories of what they’ve done medically to be able to play every Sunday. Toradol, Vicodin, Xylocaine and Cortisone are just a few of the favorite things that team doctors use to help players get back on the field. In the film, Healing Agents, former TE Craig McEwen talks about eating Vicodin like Flinstone chewables. “I took the pain and I took the needle, without question.” Former Redskin and popular current ESPN analyst Mark Schlereth says that he’s done it all. Particularly, Toradol use in the NFL is getting a much closer look since negative publicity in the news and on television is making the post-op pain killer more of a household word. University of Southern California team doctor, James Tibone, M.D. is currently being sued by a former player who alleges that Tibone’s frequent injections contributed to the 20 year old suffering a heart attack. And last season, Brian Urlacher appeared on HBO’s Real Sports and told Andrea Kremer that he uses the drug on a regular basis. 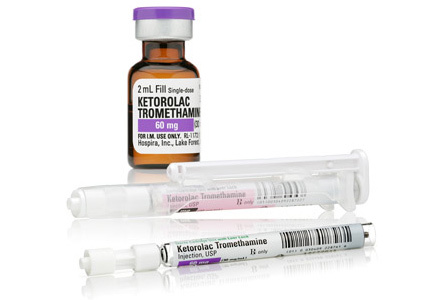 Use of Toradol, also known by its generic name Ketorolac, is currently banned in several European countries. It is perhaps the lack of antidotes to rare NSAID related adverse effects that have led to ketorolac being banned in France, Germany, Greece, Portugal and the Netherlands. The NFL’s top lawyer and executive vice-president Jeff Pash points out that overuse of pain medication isn’t limited to the NFL.